Rates are based upon 2 adults and their minor children 18 & younger. Any additional adults are $8 per adult per night extra, this will be due upon arrival. 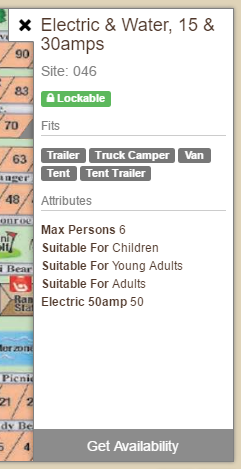 No More Than One Camping Unit Per Site. 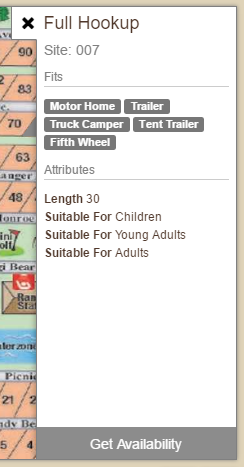 A Camping Unit is Defined as a Tent, Travel Trailer, Pop-Up, Fifth Wheel, etc. Two Vehicle Passes are included with your reservation. Please contact us if you are looking to make group camping reservations. 2 Night Minimum to Make Reservations. 3 Night Minimum to Make Reservations for Holiday Weekends. Individuals Must be 21 years old or older to Register for or Reserve a Site or Cabin. If Two or More Young People are Camping Together Everyone Must be 21 or Older. Please note there is a $5.00 Book Your Site Fee applied when a reservation is made online.